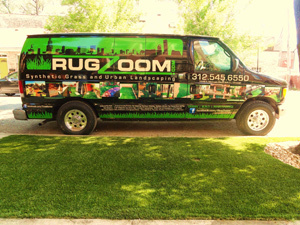 "This is RugZoom.com, synthetic turf and beyond of Chicago. 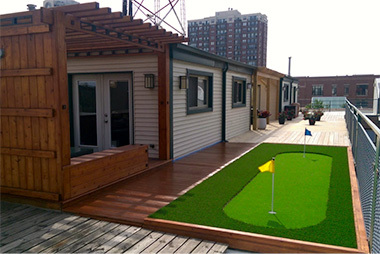 We specialize in all artificial turf applications including (but not limited) to Chicago putting green installation, Chicago artificial turf athletic fields, Chicago artificial turf dog runs, synthetic turf backyards, balconies, etc. You get the idea. Our urban landscape projects are brought to you by professional personnel with supreme service, installation, price and warranty. Synthetic turf Chicago, synthetic turf Illinois or beyond, we guarantee all our work and have 16 different lines of synthetic grass to choose from that will fit any budget. 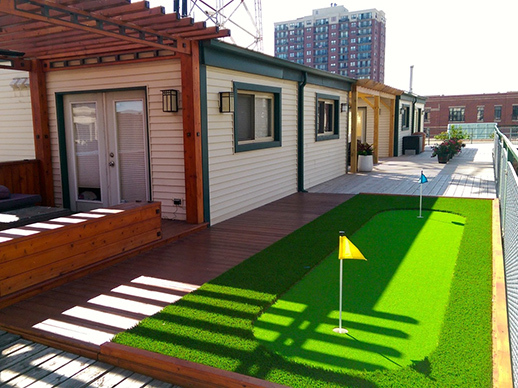 To compliment synthetic turf in Chicago we also install drainage systems, low-maintenance trees, plants & foliage, stone paths, decks, pergolas and gazebos. We cater specifically to the busy professional who is looking for an eco-friendly landscape option thats both aesthetically beautiful as well as low maintenance (or even maintenance free). Our installations from design to build are finely tuned by implementing the Six Sigma methodology into all of our operations. This helps streamline our operational efficiency so that we effectively bring to you the highest quality product, top grade custom installation coupled also with a superior price structure. This applies to the product and installation up front as well as to the residual savings associated with the minimal maintenance required in the years ahead once complete. City or suburbs, commercial or residential; we have just the right Chicago artificial turf and landscape design for you. Call (312)545-6550 anytime or fill out our online request form. If you prefer we can work with you over the phone or email prior to arranging a time to meet for an on-site survey and consultation. Soon after, well follow up with a custom landscape design and estimate. Its all totally free and very easy, no obligations. Check out our FAQs for more information or take a moment to zoom through this artificial turf (and beyond) website. Click on any of the photos or videos in the various title categories and dont forget to turn up your speakers if you like electronic music as much as we do! Near or far, were excited to show you what we have, do and can offer. 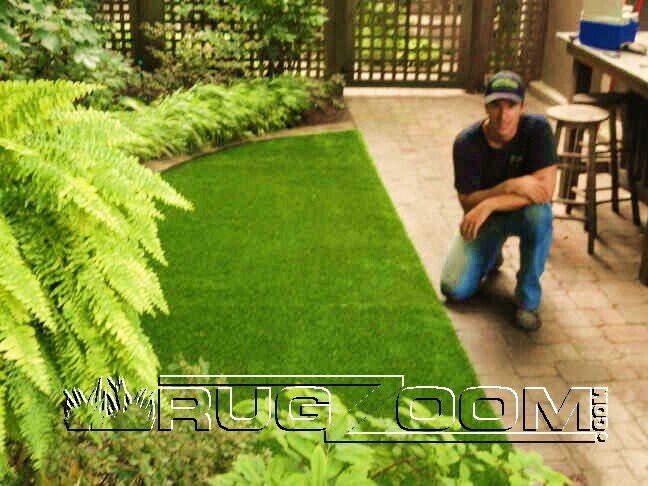 - RugZoom Synthetic Grass & Landscaping, Chicago, IL." RugZoom is a full service artificial turf landscape and supply company utilizing both low-maintenance real and artificial turf products e.g. grass, trees, flowers, plants, shrubs and foliage. Sometimes referring to our artificial turf in Chicago as "grass rugs", we're stocked with plenty of them. 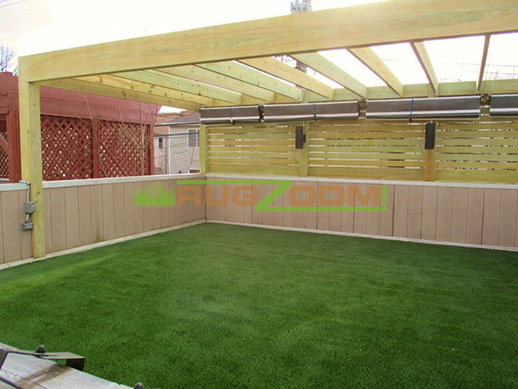 RugZoom carries 6 different lines of synthetic grass from which you can select which best fits your functional and aesthetic preference as well as budget. 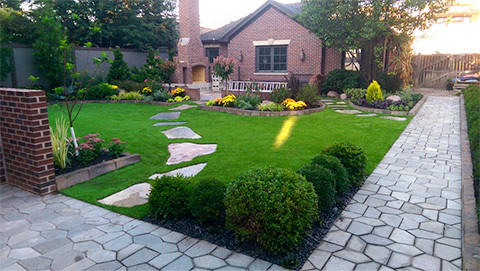 By creating unique, custom and very low maintenance landscapes for urban & suburban residences throughout Illinois; we cater to the busy homeowner. From sport fields to dog runs, single-family home front yards or back yards to concrete balconies of high-rise condos in the Loop, no project is too big or too small. We specialize in artificial turf installation in a wide variety of applications and compliment this by also building really cool decks, pergolas, arbors, gazebos, retaining walls, full landscape design & build.